Supported Side-Lying Pose. Photo credit http://www.awakeningpresence.com. The effort lies in mindful, focused states of breathing, concentration and relaxation. This is prompted by calm, gentle instruction. Restorative Yoga is a physically-passive Yoga practice which supports the sister habits of attentiveness and stillness in a setting that is made to be truly comfortable. Once the body is comfortable and still, the breath and the mind follow, restoring and refreshing the mind, body and spirit with true rest. …Relaxation is one of the most difficult skills to master. Restorative Yoga Is A Bold and Transformative Practice. 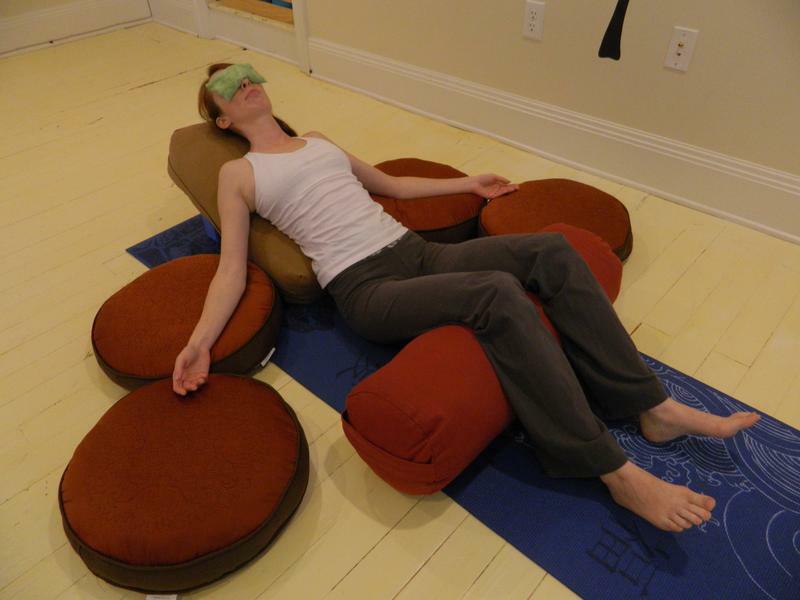 Restorative Yoga is a resilience technique effective in countering dysfunctional physical issues and to support healthy nervous, endocrine and immune system function. Safe, comfortable forward bends, backward bends, twisting poses and inversions nourish the entire nervous system. Accordingly, emotional, behavioral and social issues are relieved by nurturing the relaxation or“rest-and-digest” response while cooling inflammatory stress “fight-flight-freeze” responses. 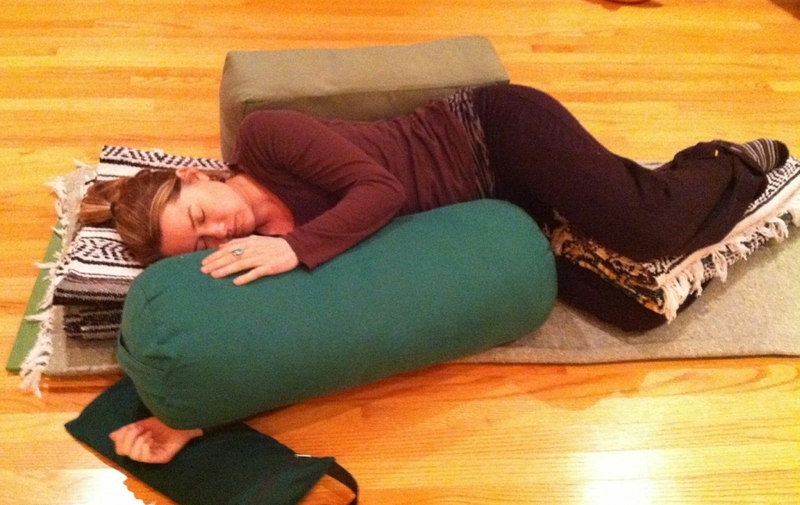 Most anyone can practice Restorative Yoga. 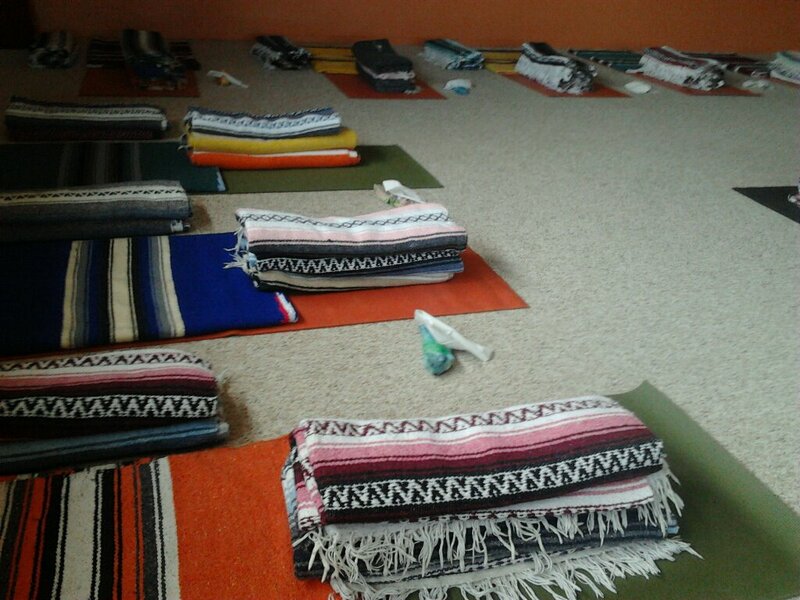 The significant propping of unique body types using blankets, bolsters, weight bags and other means is the cornerstone of the practice. Props, including blankets, bolsters, weighted bags, straps and eye-pillows, are provided for you. Experience your most comfortable Yoga practice ever. As you hover in comfort between wakefulness and sleep in Restorative Yoga poses, changes in neurology – brain waves – shift. A sense of renewed wellness can be observed long after you leave the Yoga mat. Common benefits from the first class include better sleep, relaxed muscles, lowered heart rate, ease of chronic pain and pleasant states of mind. A Restorative Yoga practice is a bridge between active body practice and meditation called Yoga nidra (the practice of stillness in relaxation) by way of time spent in exquisite physical comfort. Preparing for For Restorative Child’s pose. Photo credit Brooke West. Restorative Yoga bridges classical Yoga to its therapeutic roots by promoting ease and deep, physiological and neurological rest. Yoga philosophy is beautifully compatible with 12-Step philosophy. Members of 12-Step recovery programs, as well as non-12-Step recovery models, are encouraged to practice Yoga and meditation to complement their recovery. If you live with or experience hearing limitations; trauma; chronic or acute illness; pain; are recovering from injury, physical, psychological or psychiatric illness, surgery, grief or other matters that affect your quality of life, please be forthcoming. Integrated modifications for individual situations are the foundation for comfortable, beneficial and efficient Yoga therapy.